Do you love cats? So does Mrs. Brown! She has many, many cats who sleep all day and party all night. 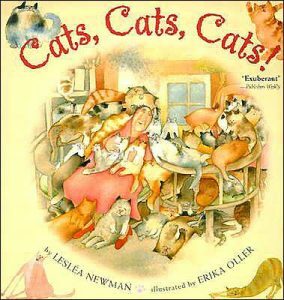 Join the fun as Mrs. Brown’s cats throw confetti, eat spaghetti and do all sorts of things that make Mrs. Brown laugh with delight. This photo was taken when Princess Sheba Darling and Precious Sammy Dearest were brand new kittens. Aren’t they cute? I wrote Cats, Cats, Cats! because my two cats, Princess Sheba Darling and Precious Sammy Dearest, sleep all day and romp all night! Even though they get into all sorts of mischief, I love them just the same. You are here: LesleaKids.com > Books for Kids & Teens > Picture Books > Cats, Cats, Cats!